Ask a bodybuilder how he built his traps and heÂll simply shrug his shoulders. This is more truth than joke, for most of us put about as much thought into trapezius training as we do trapeze artistry. Chances are you simply grab a barbell or two dumbbells and move your shoulders up and down for a few sets at the end of your shoulder routine. However, there are many variations of the common shrug. This month, we focus on 10 valuable shrugging exercises you probably arenÂt doing. Using these unique lifts, you can map out a fresh approach to the often-stale chore of traps training. These are sometimes called ÂHaney shrugsÂ because they have long been a favorite of eighttime Mr. Olympia Lee Haney. Instead of holding a barbell in front of your thighs, hold the barbell behind you. This position forces you to keep your scapulas pulled backward throughout the shrug, thus focusing more on yourmiddle traps (although most of the shrugging tension is still on your upper traps). You may find that a Smith machine allows you to better position yourself for this lift. You can dramatically boost the intensity of any shrug by holding the top position of each rep for three to five seconds. Such peak contractions are especially effective for shrugs because, unlike many lifts, there is no lockout at contraction and, with your arms perpendicular to the floor, gravity is maximizing its pull. This is the inverse of incline shrugs. While lying face-down on an incline bench or a high flat bench, hold either a barbell or two dumbbells with your arms straight and perpendicular to the floor. Do not shrug your shoulders toward your ears. Instead, while keeping your arms straight, lift the weight(s) by contracting your scapulas. This works your middle trapezius and other muscles of your upper back. Grab a straight bar attached to a low cable and stand back so the cable, as well as your arms, are at approximately a 45-degree angle to the floor. Shrug your shoulders back and up at the same time. The angle of resistance works both your upper and middle traps (middle back). Although this unique exercise can be performed with either a barbell or two dumbbells, we recommend using a Smith machine for safety and convenience. Begin by holding the bar overhead, as if in the top position of a military press but with your scapulas pulled down as far as possible. Then, push the bar up as far as possible by elevating your scapulas. The trapezius is commonly referred to as a single muscle, but it actually consists of two muscles, one on either side of the spine. Together, they form a sheet of muscle roughly the shape of a kite, originating at your skull and the top of your neck and extending all the way down the spine to your middle back, fanning out to the ends of both clavicles and the top of the scapulas. The main function of the upper area of your trapezius is to pull up your scapulas (shrug your shoulders) and extend your neck back. The main function of the middle area of your trapezius is to pull back your scapulas (draw your shoulder blades toward each other). Most bodybuilders train traps with shoulders, but training them with back is also a logical choice. 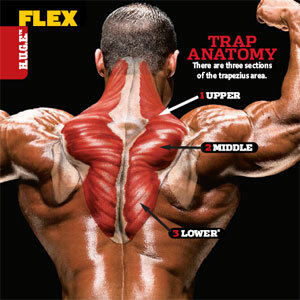 The middle traps are worked primarily with back exercises, such as rows. Your trapezius muscles are among the busiest helpers in your body, assisting with lifts as diverse as deadlifts, bench presses, barbell rows and squats.